contemporary horticultural displays in the show gardens at the water’s edge. The masterplan clearly defines the new and the old allowing visitors to experience both. Jurong Lake Gardens are the heart and lungs of a vibrant new cultural landscape where science, heritage and preserving nature are equally respected. The Japanese Gardens are surrounded by landforms which enclose the heritage gardens and create new sculpted landscape spaces for outdoor events and horticultural gardens. The core of the Chinese Gardens is enclosed by a perimeter wall with multiple gates which allow visitors to move between heritage and contemporary garden spaces. 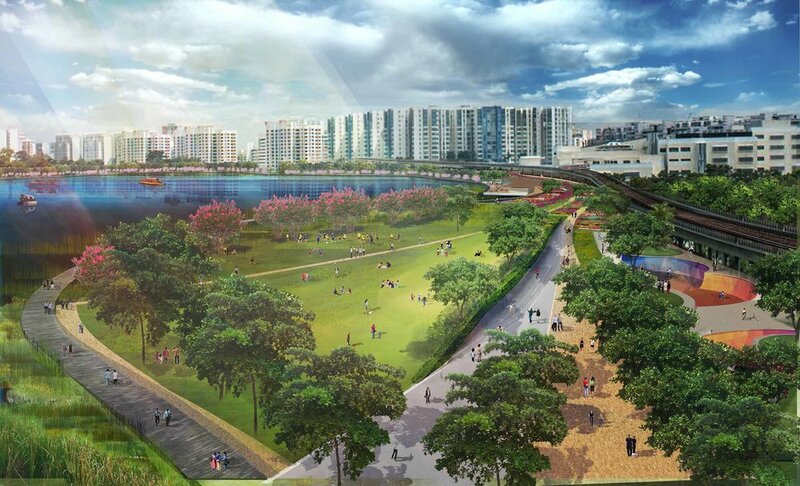 inviting participation and making access from public transport and car parks on Jurong Lake West as easy as possible. New bridge links connecting the two islands to the mainland provide pedestrian access and the ability for people movers to circumnavigate the islands. Visitors are brought to the gates of the walled Chinese and Japanese gardens which are vehicle free for people to stroll through the heritage gardens in a pedestrian friendly environment. The lakeside edge provides a unique experience for visitors to Jurong Gardens. The character of the edge condition is varied and offers a variety of opportunities for visitors to engage with the water’s edge. The boardwalk along JLG East allows visitors a viewing platform for dragon boat races and other lakeside boating events and activities. Here the boardwalk is suspended with open water on one side and reed planting on the other. The horticultural displays and co-creation gardens are located adjacent to the water activating the perimeter of the island and allowing wonderful views of the lake as a backdrop. Existing natural habitat where native flora and fauna have been allowed to flourish are protected, maintained and enhanced to encourage the biodiversity and ecology of the lake.